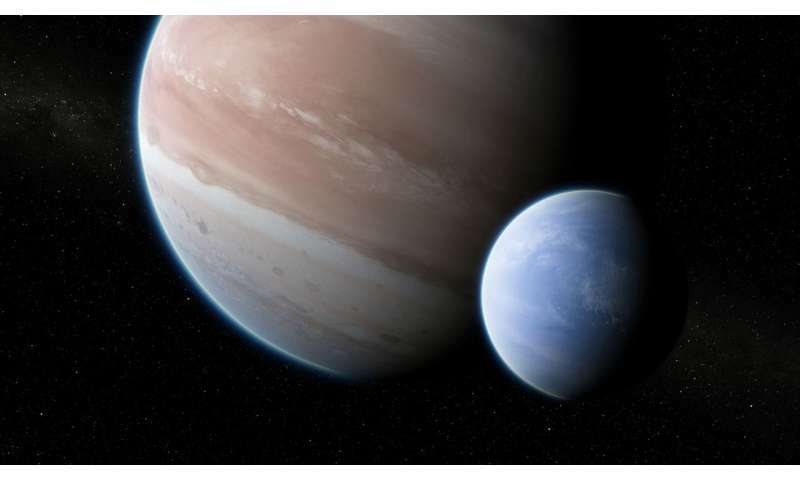 In a paper published Oct. 3 in the journal Science Advances, Alex Teachey and David Kipping report that the detection of a candidate exomoon—that is, moons orbiting planets in other star systems—is unusual because of its large size, comparable to the diameter of Neptune. Such gargantuan moons do not exist in our own solar system, where nearly 200 natural satellites have been cataloged. "This would be the first case of detecting a moon outside our solar system," said Kipping, an assistant professor of astronomy at Columbia. "If confirmed by follow-up Hubble observations, the finding could provide vital clues about the development of planetary systems and may cause experts to revisit theories of how moons form around planets." The Kepler results were enough for the team to get 40 hours of time with Hubble to intensively study the planet, obtaining data four times more precise than that of Kepler. 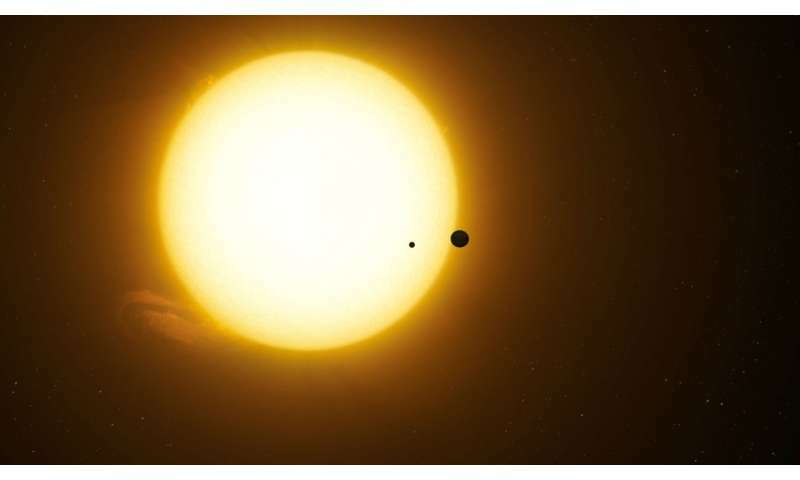 The researchers monitored the planet before and during its 19-hour-long transit across the face of the star. After it ended, Hubble detected a second and much smaller decrease in the star's brightness 3.5 hours later, consistent with "a moon trailing the planet like a dog following its owner on a leash," Kipping said. "Unfortunately, the scheduled Hubble observations ended before the complete transit of the moon could be measured." "An extraterrestrial civilization watching the Earth and Moon transit the Sun would note similar anomalies in the timing of Earth's transit," Kipping said. 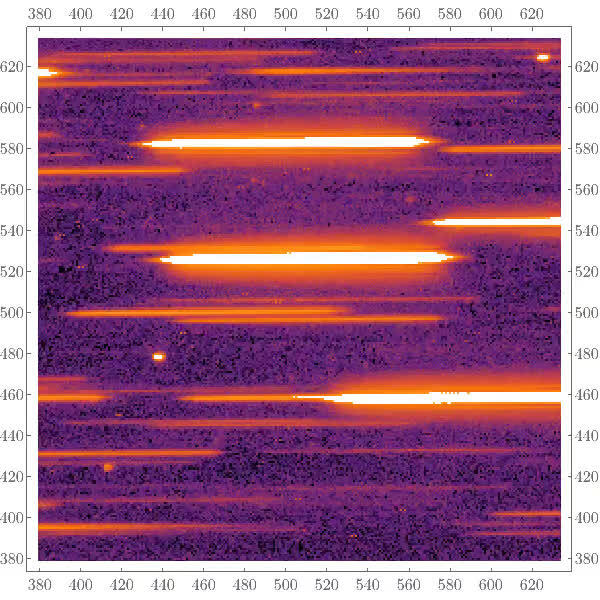 "A companion moon is the simplest and most natural explanation for the second dip in the light curve and the orbit-timing deviation," said lead author Teachey, NSF Graduate Fellow in astronomy at Columbia. "It was a shocking moment to see that light curve, my heart started beating a little faster and I just kept looking at that signature. But we knew our job was to keep a level head testing every conceivable way in which the data could be tricking us until we were left with no other explanation." The moon is estimated to be only 1.5 percent the mass of its companion planet, which itself estimated to be several times the mass of Jupiter. This value is close to the mass-ratio between the Earth and its moon. But in the case of the Earth-Moon system and the Pluto-Charon system—the largest of the five known natural satellites of the dwarf planet Pluto—an early collision with a larger body is hypothesized to have blasted off material that later coalesced into a moon. Kepler 1625b and its satellite, however, are gaseous, not rocky, and, therefore, such a collision may not lead to the condensation of a satellite. The host planet and its moon lie within the solar mass star's (Kepler 1625) habitable zone, where moderate temperatures allow for the existence of liquid water on any solid planetary surface. "Both bodies, however, are considered to be gaseous and therefore unsuitable for life as we know it," Kipping said. Future searches will target Jupiter-sized planets that are farther from their star than Earth is from the Sun. There are just a handful of these in the Kepler database. NASA's upcoming James Webb Space Telescope could really "clean-up" in the satellite search, Kipping said. "We can expect to see really tiny moons." Well duck, this system isn't following the rule book, per your expectations. Better get use to having your cage rattled. So far it is looking like every star and every star system is going to include the unexpected and the unpredicted. More evidence for the speculation that stellar formation and resultant planetary systems are not only NOT systematic. But a stochastic process of random chance modified by tumultuous mayhem. Considering this is Cosmos wide? A form of Brownian Movement on a Universal scale? Would it mean we are all inhabiting a prodigious fishbowl? The data is pretty confusing. Most of the data indicates that Kepler 1625b tidally locked or on the border. It is too early to spend energy to the story of the month. It is particularly unconvincing to claim that the density is 10.15 g / cm3. "However, it is up to 10 times more massive (about 3,180 Earth masses), based on observations of its candidate moon. This puts it just below the deuterium-fusing limit, which is around 13 Jupiter masses. Any more massive and Kepler-1625b would be a brown dwarf. Because of this high mass and radius, the planet likely has a very strong gravitational pull,". A near brown dwarf, or a low fusion star, would be dense.